About Me: I am 59 yrs. young...... I LOVE to create pretty much ANYTHING! If you would like a personalized card please use the "contact this artist" link at the bottom middle of this page or email me at nancyscards@gmail.com with your request! ...... Please allow time for me to create the card(s) and for it to be approved. Thank you so very much! I am excited to have my own creations on the internet for you to enjoy. So, please do enjoy and thank you for visiting to my store. You can personalize your card and have it mailed to you or your recipient! You can also choose to pick it up at a local Target store! Family and Friends and Co-workers! Please stop by often! I will have more cards every week! and get ideas of what I can do for you! 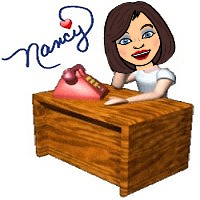 Dear Nancy...My nephew and his boyfriend are getting married soon and I was looking for a really nice wedding card for a gay couple. Needless to say, the local stores don't cater to this need. I Googled and found this web site and I found your beautiful card. So appropriate. There were a few of them I could have easily chosen but I bought the one with the 2 men holding hands in suits. I had their names put inside as well...something you don't get at the big name card stores. I told my daughter about this site. She is also invited and will be needing a card. I am sure to pass this site on to my co-workers as well. Thank you for a lovely card that I can be proud of to present to my nephew and husband-to-be. Joanne Scranton, PA. This has got to be the best greeting card store I have seen by far. Very creative mind you have there Nancy. I love your cards! Wish you plenty more sales! Jeannette Goff/ Netta's Art. These are absolutely the cutest cards ever! Thank you for having such great cards! I look forward to more on your site! Great Job! wow! These cards are cool! I love them! Great work! Very imaginative, very creative! Love these cards! Can't wait to see more! Nancy is a wonderful artist very creative, just give her a suggestion and she can run with it, many of her friends and family have seen this talent first hand you will not be disappointed. Linda B.